With my time in the North West now drawing to a close, it is time to right any of my wrongs associated with the region. Being relatively near to the National Football Museum and not visiting it, considering, would seem foolish, particularly when it’s gratis in. The museum is built into one corner of Preston North End’s ground but I’d forgotten about this when turning up, twenty minutes before kick-off, at Deepdale two pre-seasons ago. This ghastly oversight was compounded by the fact that the game itself was possibly the most insipid and meaningless in the history of the sport. In fact, my desire to return to take in the museum was largely motivated by a keenness to discover whether it had been commemorated as such. Sadly, no plaque nor trinket is yet on show to make some sense of those ninety minutes which, quite frankly, I won’t be getting back. No sculpture of a fan arched backwards over their seat, fast asleep. No painting of a stand full of heavy eyelids. Nothing. Still it’s a pretty good way to spend a couple of hours but, yer hobo being, well, me, might as well combine football’s past with its present and, thus, Preston’s satellite town of Bamber Bridge seems best bet, for a Unibond League Division One derby n’all. Well, it sort of is, the two Lancashire sides having only met ten times, mostly in local cups. It’s only just over a fortnight since their last meeting though, in the FA Trophy, with Clitheroe coming from two down at Shawe View to win 3-2. No doubt tonight’s game will be tastier for that immediate previous than for any other prior encounter. Certainly from what I see on getting to the ground unusually early, the Clitheroe support seem quite keen on it. Several, clad in away-day orange, are so well-established inside the Irongate bar as to appear at some distinct risk of developing a form of trenchfoot. 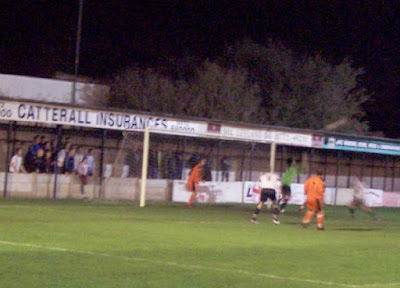 This is not to suggest a messy social facility, indeed while most of the ground betrays the fact they are only sixteen years out of the Preston & District League, the shiny lounge bar and the stand that rises up in front of the railway line highlight how far they’ve come. Less impressive, I guess, is the club shop that struggles on with barely one working lightbulb, the large programme archive largely lost to the dank. Also not quite sure what to make of the waste bins around the ground that have “toxic waste” still clearly stencilled on the side, or indeed the filing cabinet stood at one end of the urinal in the gents, forced to face the wall like it’s pulled its sisters hair or something. 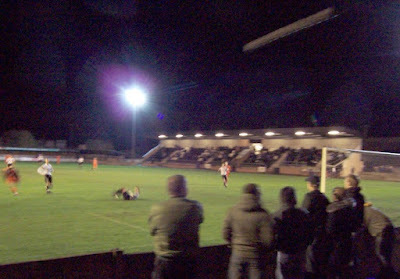 Behind the far goal, a group of about twenty young fellas are gathered, and they represent Bamber Bridge in song. “When the bridge go marching in” they chirp, which might highlight a poor grasp of English grammar, a startling feat of architectural engineering, or neither. Thank goodness for the football context, the great exception to all linguistic convention. From the kick-off it is Clitheroe who look the stronger, but it is the home side who take the lead after eleven minutes. A long, log flume of a throw down the left flank beats a sleepy Jamie Nay. This allows Greg Brickell to break and play a quick ball across the box for Alex Porter, who rifles past the magnificently vast afro between the sticks, as well as the spindly keeper beneath it. It would appear that in a disco outfitters somewhere there is a pristine square. A square vivid in its cleanliness amongst the dusty, faded lino, particularly when lit by the sun through the adjacent window. A window which now displays a card reading “Reward offered for return of ‘the funky mannequin’”. Actually, that previous analogy doesn’t quite work, as mannequins don’t tend to flap as much as your man here, and frankly given the choice between the Clitheroe keeper and a dummy from the Marks and Sparks underwear section when it comes to dealing with crosses, you’d plump for Bra and Pants Annie everytime. Indeed, seven minutes later, he almost gifts Bamber a fortuitous second. A curling cross eludes everyone and our man merely shrugs, before flinching in that resigned way as though a glass of red wine is just passing the midway point on its descent from a cluttered mantle to an off-white fur rug, as the ball brushes the outside of the post. Clitheroe however then push forward, but perilously. A flicked header is slightly misdirected and the miss is pounced upon by the home side as they race forward, Paul Roberts unleashing a shot that brings a, credit where its due, terrific flying stop from Clitheroe’s now far more alert Ray Frances. Back at the other end a regulation flying catch from Bamber’s gloveman David Newnes earns him an “England’s number one” chant, with the kids almost speaking too soon as he not long after misjudges a bounce that requires him to grab it at full stretch on the goal-line. He isn’t tested often though, one particularly misjudged cross from a Clitheroe midfielder going stupidly high before dropping idly over. 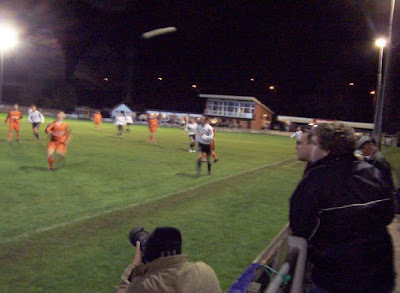 The ball eventually comes down on the edge of a bin, sending it up in the air again where, on its second descent, a Clitheroe supporter attempts to belt it back onto the pitch but only succeeds in spooning it over his own head, the pavilion behind the goal (the tallest part of the ground, mind you) and into the car park. It is metaphor for Clitheroe’s first half showing. One step forwards, two steps back. Some of the vocal lads decide to experience some on-field action as the teams come back from their break, and while the PA announcer eventually thanks them for their support whilst attempting to shoo them off, he possibly over-eggs his initial warning a touch, “For health and safety reasons, would all spectators leave the ground.” Had this announcement comes across during the interval in that Preston friendly, I can guarantee you I would not have needed asking twice. In the tea bar queue, one of the Bamber youngsters is taking issue with the opposition’s away colours, “You’d be embarrassed to wear orange” he says, without checking around for any Dutch, adding quite emphatically, “I pity the fool who wear orange.” He eventually reaches the head of the queue and settles on some crisps, flavoured of course, as he clearly wouldn’t go for the plain. Sucker. After six minutes of the second half, Bamber Bridge make it two, a corner floated in over Clitheroe’s once again seemingly stoned keeper, and Brickell aims an ungraceful but effective header down onto the line and up into the roof. Four minutes later, Brown welts a free-kick from the right and it is an entirely coincidental appearance of the keeper’s fist in the right place that sends it over. You might think that’s a little harsh, but he then proceeds to drop the ensuing corner. In fairness though, he does make a vital fingertip save moments later. Come the hour mark and the Clitheroe defence has taken on the mannerisms of their keeper, looking tired and leggy, and Carl Noon easily outpaces them and just gets his cross in from the byline under pressure. Brickell gathers, turns and curves a quality shot just inside the far post to make it three. With fifteen minutes to go, Clitheroe claw one back, Paul Lamb receiving a deflection before calmly depositing the ball past Newnes and escorting the ball quickly back to the halfway line. With five minutes to go, Clitheroe’s Simon Garner is tunnelled following some Greco-Roman wrestling in the centre circle, which ends up involving most of the players, and with him go his teams chances of rescuing another seemingly lost cause against the Bridge. Your football blog is so very enjoyable. We hear about Britain and footie. Keep going. (It's anonymous again - pierre actually, I just can't do computer stuff. Indeed I'll go further you have the making of someone who can write. Thanks very much. That means a lot. Cheers! As a keen 'Brigger' (and regular PA announcer for the club, when work commitments allow me to get down to Irongate), I have to say that this is probably the best observed write-up of a game at the 'number one ground in South Ribble' I've ever witnessed. Alas, I'm disappointed to discover upon inspection of an old diary that I was in fact at the Everton v Luton Town Carling Cup fixture that night, and sadly cannot claim credit for the excellent PA announcement made on this particular occasion - a message I have been tempted to utter myself on numerous occasions when such footballing giants as Durham City and Abbey Hey have come to town and spoilt the party. However, our alternate PA man, George, is currently recovering from gall bladder surgery, and I can amuse him during his recuperation by letting him know that his words have been immortalised on this excellent site!